Pediatric Medicine deals with the kids and neonate. The neonates are the very vulnerable group of patients. A slight miscalculation can cause the drastic effect. As for example, Amikacin is commonly used in neonate ward. It is a nephrotoxic drug. So excess dose can cause serious damage to the kidney in neonates. Also, the fluid calculation is essential. Excess fluid can cause oedema and insufficient fluid can cause dehydration easily in pediatric and neonate group of patients. As the Intern doctors have less experience in pediatric dosing, this app will help to easily calculate the dose instantly. I have checked many apps but this is the best android app for pediatric dosing and guideline. In my days of internship, we used to keep a sheet of papers available in hands in our ward. Now the technology is evolving, it’s on your mobile. 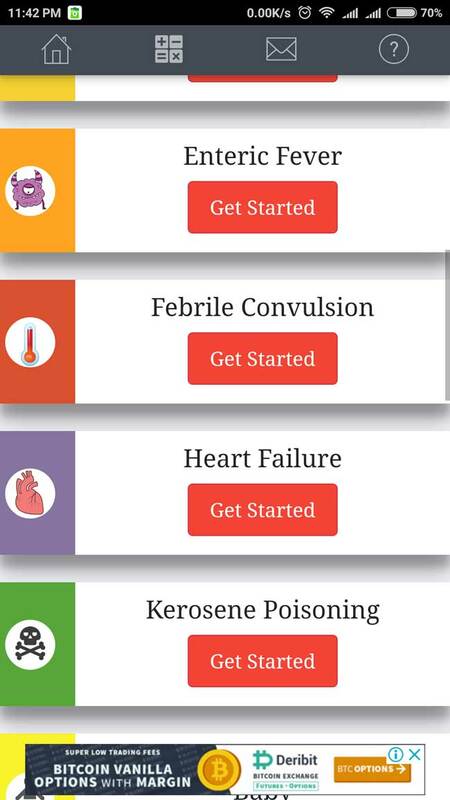 This app may help you calculate the dose but at the end, you must consult with the seniors regarding the management. Well, it’s in the early phase. There may be some bugs. Please report to the developer. This is a smart assistant for the pediatric doctors to help calculate the dose of drugs for different age and weight groups of children. It also assists the doctors to see the standard treatment requirement from the guideline for each individual child based on their weight and age. And Treatment guideline of 23 pediatric common diseases. I am proud that this beautiful app is developed by a Bangladeshi. This app can compete with any pediatric doses and guideline related apps. It has the best user interface. The dose calculation method is easy to use. No extra technical knowledge is necessary to run the app. And its thoroughly checked by Expert paediatricians. 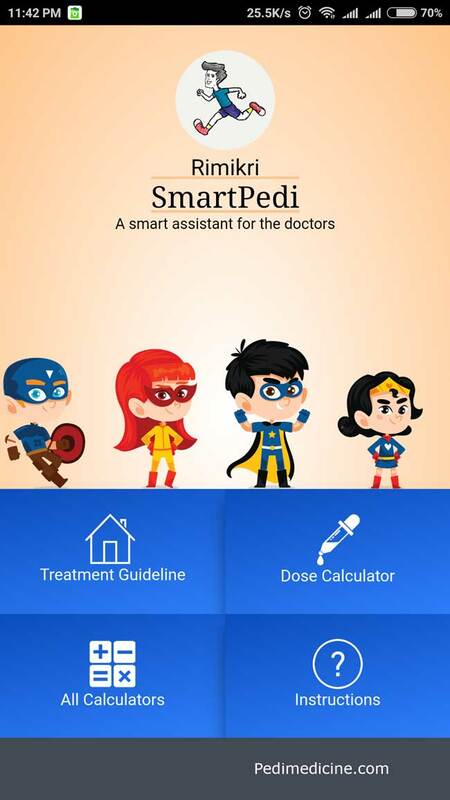 The most helpful android app for pediatric dosing and guideline. Without any verification system for doctors, this app will be abused. This app is greatly made but people other than doctors will misuse this and a disaster will happen. So, ensure that only doctors can use this app otherwise this will create a menace. Well, He is right. This app is intended for Health Care professionals use only. So misuse by the non-medical person may happen. Pediatric medicine is a very delicate sector of medicine where small deviation from the required dose of drug or fluid can be fatal for the child. Pediatric doctors need to do precise calculations of so many different drugs and fluids required for each child all the time. Doing these calculations manually can sometimes be very difficult, especially for the young doctors attending the pediatric patients in the hospital and also when fast calculations may require for attending a large number of patients who are waiting in the line. Whatever the situation is, there is no scope for an error, because the life of a child may depend on it. So, this app has been developed to help calculate the dosing and medications correctly in a few seconds. Here, I want to clarify that the guidelines described here are not alternative to an experienced doctor. This is just a tool for assistance and also inclusion or exclusion of drugs or alteration of dosage may be required based on the clinical judgment of the doctor. But I hope, this will be a helpful tool to provide even better service to our patients. • Asst. Prof. Dr Kamrul Hasan – I’m grateful to Sir as he has gone through all the guidelines personally checking them, suggesting corrections and enriching them with inputs and inspiring me the whole time to carry on.